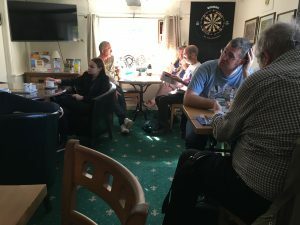 We met yesterday (13th October) for a ‘Strolling Social’, organised by our pubs officer, Ali Cook. This one was loosely based on the Citi 7 bus route, and we used a combination of walking and bus to get around. 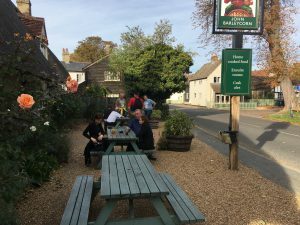 We met at the Ickleton Lion, a nice village pub with a garden where it was lovely to sit during yesterday’s unseasonal warmth. It’s a Greene King pub so I was pleasantly surprised to see they had Oakham Bishops Farewell, one of my favourites, on as a guest ale. Best of all it was in first class condition and an excellent start to the tour. I would have loved to stay for another but it was time to stroll to Hinxton, about a 25 minute amble. We called in to the Red Lion where I had a pint of Crafty Carpenters Cask. The earlier Bishops Farewell was a hard act to follow, and I didn’t think the Carpenters Cask was quite on top form. Nice nonetheless, and I sat outside in the sunshine letting the pleasant breeze cool me off after the walk. Strolling time again, to Duxford. It was hot but the breeze made walking pleasant. According to the weather app it was 26C, which is going some for October. We arrived at the Plough, my first visit since the recent change of management. Nothing else seems to have changed much, and the Everard’s Tiger was very nice as usual. We had some time here to grab a bite to eat. Just a few minutes walk then to the John Barleycorn, also in Duxford. Another Greene King pub with Oakham Bishops Farewell on as a guest. I just tried a half here, and it was great. Luckily the pub has a bus stop near it, so needing to get to Sawston next, we all clambered aboard the number 7 bus. Our next stop was Turpins’s Brewery. Mostly I have heard people say its in Sawston, but its really in Pampisford though it can be tricky to know where the border is. Our guide here was Edita who with her sister had been with us on the stroll from the start. 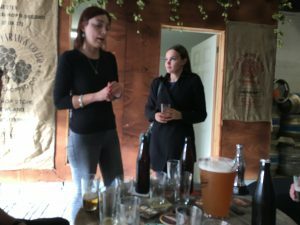 We got to taste their new lager (!) and some Cambridge Black which I think is one of their best beers. It was then time for another stroll to the Chequers, also in Pampisford. 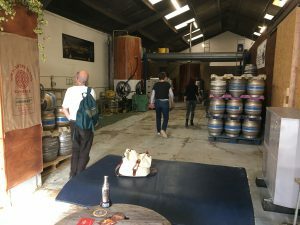 Here I had a drop of the Timothy Taylor’s Boltmaker which was a good beer for me to end the tour with. After the Chequers it was a walk back to the bus stop to get back aboard the Citi 7. The tour continued at the White Lion in Sawston, but I stayed on the bus when the others got off as it was time for me to head home. The nature of these Saturday Strolls is that it is very easy to join and leave when ever you want, if you only have a limited amount of time you can still take part. The next Strolling Social is around Ely, on 15th December and all members are welcome to come along. Further details will be in Ali’s monthly emails, or if you have any questions you can email Ali directly. So come along next time for a pre-Christmas drink and a pleasant walk around the City of Ely.